Rochelle is a Las Vegas native and received her Juris Doctorate from Boyd School of Law. She always knew she wanted to go to law school and every time she learned of an injustice her passion to take part in facilitating reform grew. Through her experience, she learned there was an invisible barrier that existed between those economically challenged and retaining legal counsel to be advised on a very confusing and overwhelming justice system. Through this realization she came to understand how this barrier affected so many more. She knew she had to find a way to assist as many people as she could. After law school, Rochelle took a job with a group of attorneys who shared the same passions to fight for those who couldn’t fight for themselves. Her firm’s practice focuses on supporting the community, and Rochelle believes that pro bono is an important aspect of giving back. Rochelle began her pro bono service by volunteering to represent children in the foster care system to ensure they do not become casualties and that their voices are heard. More recently, she began representing victims of domestic violence in need of a pro bono attorney. With each story her clients tell, she is reminded why she went to law school. Her clients inspire her to continue doing what she does. This is so very important because there is an overwhelming need for this type of service and without it so many would go without justice. 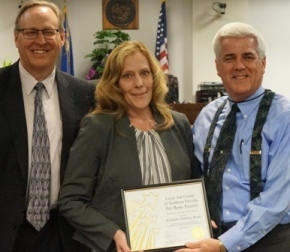 For her commitment to representing pro bono clients, we honor Rochelle Harding-Roed as our April Volunteer of the Month.